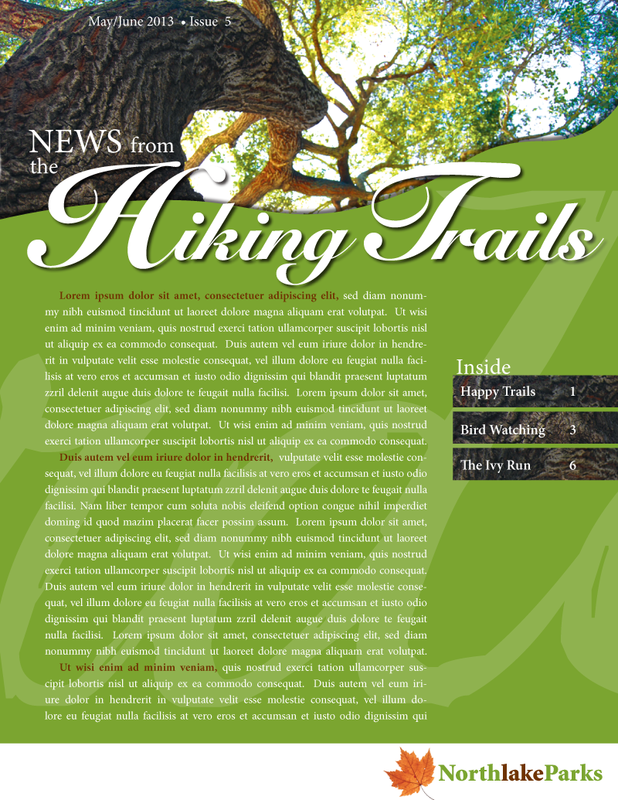 Trees can add lots of dimension and curve to a newsletter layout. Here’s a sample design that we created using a photo from a nature hike. Next time you are on a hike, just tilt your camera, point and shoot. It’s that simple. It’s always best to take lots of photos to get the best shot. First, we sifted through our camera roll to find the best image. Next, we cropped, color-corrected and angled the photo. We utilized some color enhancement techniques in Photoshop. In this case, we adjusted the contrast and sponged in sections of the leaves with the saturation tool to increase the brilliance of the image. 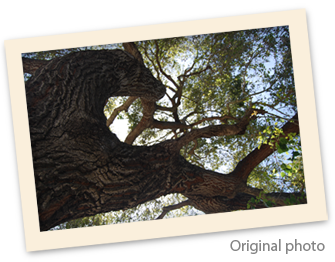 We then cropped the image to give dramatic angles and to provide for an interesting compositional layout. We then added the image to the masthead on the newsletter page. Then we added colors that compliment the photo. We used the eyedropper tool to pull the same green from the image and used this color in the middle of the page. Next, we added a natural-looking typestyle. Then we screened an enlarged version of the type in the background to create an interesting pattern effect. Finally, we repeated a section of the tree bark for the “Inside” (table of contents) bars on the right. This effect is great for newsletters about hiking, nature, recycling, conservation, Earth Day, travel, outdoors, gardening, the environment and arborists.